Guitar; Keyboard; Piano; Voice Composed by various arrangers. This edition: Easy Hits Piano (Hardcover Edition). Book; P/V/C Mixed Folio; Piano/Vocal/Chords. Alfred's Easy. Children. 240 pages. Toddlers and young children love to sing and dance classic nursery rhymes and songs. This activity strengthens bonds with family, encourages brain development and musicality, and most importantly, it's fun! This beautiful keepsake collection of over 100 classic nursery rhymes, playground songs, activity tunes, and memory rhymes ensures that all those bases are covered for parents, teachers, and their kids. 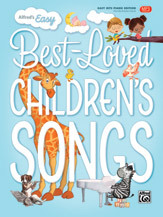 Carefully arranged for piano to play and sing with toddlers and young children, each song also includes guitar and ukulele chords for easy strum-and-sing performance. The book features a "Genre Index" that breaks the titles down into song types and categories---especially useful for educators. Finally, an "About the Songs" section rounds out the collection with a brief history of all the tunes, and, to demonstrate what the songs should sound like, professional MP3 recordings of every song can be downloaded from alfred.com with purchase.